Last night, Sony premiered the first-ever look at that teenage alien invasion movie The 5th Wave. And what started out as a boy-meets-girl, high school love story got fairly dark fairly fast. But we’re still not sure what to think about this movie. Based on the much buzzed about YA book by Rick Yancey, The 5th Wave movie adaptation feels like How I Live Now meets I Am Number Four. And the presentation was pretty deceiving. The whole thing starts with main character Chloë Grace Moretz meeting a cute guy and participating in some super-uninspired conversation about their smartphones. What seems like a normal teenage film is then swiftly undercut by a newscast — something is hovering in Earth’s atmosphere, nd it’s some sort of UFO. People are nervous, Ron Livingston pops up to tell Moretz that they’re aliens and they want their planet (or something). The tone switches from light to dark very quickly. But there’s nothing bolstering the thematic change — everyone is just pissed. And then the action starts! A passenger airplane falls right out of the sky. The townsfolk of this quiet suburb run. Next thing you know, the military is everywhere and things are operating like a prison camp in a war zone, and the suburb is being ripped apart. Moretz is separated from her little brother (this troubles her, but I’m not sure how much because this is the first time we’re learning about their relationship). Obviously, this is a cut-up show reel so it’s hard to gauge character emotion, but in the book the main character spends more of the book searching for her younger brother. Perhaps this will be the same. 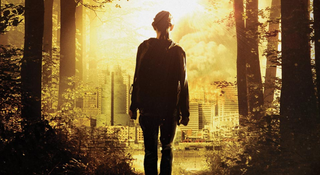 When Schreiber returns, he mounts an attack and tells his army of teens and whoever else is still around that “If the 5th Wave succeeds, humanity will be wiped from the face of the earth.” Okay, so The 5th Wave is the alien attack? Sure.